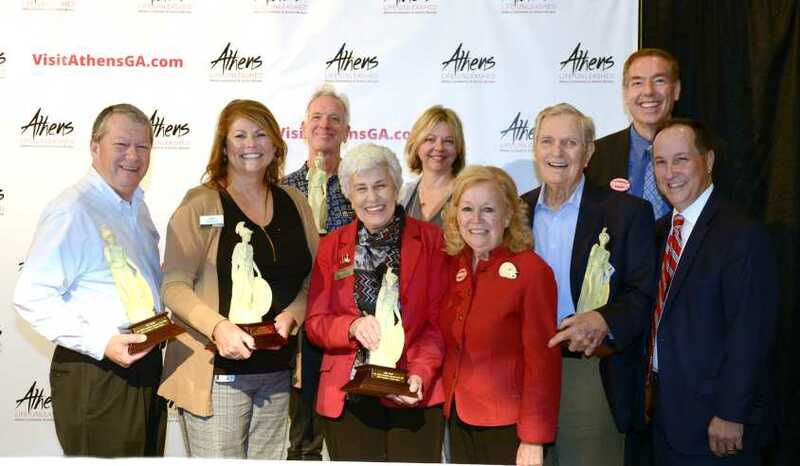 The Athens Convention and Visitors Bureau (CVB) held its annual meeting Wednesday, October 24, highlighted by the release of the new economic impact figures for Athens-Clarke County and the presentation of the annual Athens Hospitality Awards. Visitors to Athens-Clarke County spent $310.17 million in direct domestic spending in 2017, a 6.11% increase over the previous year, according to the 2017 Travel Economic Impact on Georgia State, Counties and Regions study prepared for the Georgia Department of Economic Development by the United States Travel Association. Tourism in Athens-Clarke County generated 2,872 jobs with a $65.14 million payroll, as well as $12.96 million in state tax and $8.28 million in local tax collections. Total state and local taxes of $21.24 million were collected from visitor spending. Each household in Clarke County would need to be taxed an additional $473 per year to replace the state and local taxes generated by direct domestic spending alone. Though final numbers for total tourism impacts for 2017 are not yet available, prior years have demonstrated that when domestic and international visitors are included, with direct, indirect and induced impacts, that tax relief figure almost doubles. The CVB also presented the annual Athens Hospitality Awards, which recognizes the outstanding work of individuals whose efforts have made a positive impact on the Athens-Clarke County visitor experience. The Partner of the Year Award honors a CVB partner in the local hospitality industry who recognizes the value of working together to achieve greatness. The person not only understands synergy, but also embodies the hospitality aspect of tourism to its fullest degree. This position is a shining example to others about how to partner with the CVB. The 2018 Partner of the Year Award was presented to Michael Lachowski, public relations coordinator of the Georgia Museum of Art (GMOA). Lachowski has been an integral part of the Athens creative community for four decades, starting with his band Pylon. More recently, Lachowski has expanded the GMOA’s reach to Athens residents and visitors alike, through his work on the museum’s website, app and print materials. Additionally, he created Third Thursdays, where a half dozen local art galleries open in the evenings for tours and special events. Michael not only attends Athens CVB Advisory board meetings, but also regularly represents GMOA and Athens at Historic Heartland Travel Association meetings. He also goes to the state capitol for Hospitality, Tourism & Arts Day. The Hospitality HEROES (Hospitality Employees Recognition of Excellent Service) of the Year Award recognizes a front-line employee who has exceeded normal expectations to provide excellent service to visitors and residents. The 2018 Hospitality HEROES of the Year award was given to Richard Mikulka of Flicker. Mikulka has been with Flicker for 16 years and enjoys engaging with customers. Customers have described him as having an expressive face and listening ear. Mikulka is also an outspoken supporter of local businesses, and helps new people get acclimated to Athens. “As the youngest in his family, he has learned to be patient and an ambassador of goodwill. He brings [these attributes] to Flicker daily and negotiates the most delicate of situations with ease. He has grown from being a fresh, young bartender to the brave protector that he is now. Richard is certainly the King of Hospitality for Athens, Ga,” says Avid Bookshop owner Janet Geddis, who nominated Mikulka. The Classic Host Award recognizes a local individual or individuals committed to bringing to the Athens area a new convention, meeting or event generating a significant economic impact. The 2018 Classic Host Award was given to Joni Robinson of Caterpillar. 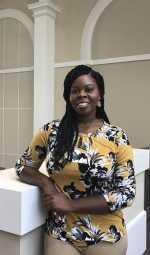 Robinson is the customer center manager here in the Athens plant. She was instrumental in bringing the Global Marketing Representative Meeting and the Caterpillar TC Conference to Athens this year. These events generated estimated visitor spending of $365,998 for Athens-Clarke County. The Louis Griffith Hospitality Leadership Award honors an outstanding individual in the local hospitality industry who displays foresight and exceptional leadership skills to impact the Athens-Clarke County hospitality industry and the community. Two such awards were presented this year, the first to Mike Waldrip of Benson’s Hospitality Group. Waldrip has served as president of the Athens hotel/motel association for many years. Waldrip recently retired as vice president of special projects for Benson’s Hospitality Group. During his tenure with the organization, he oversaw the renovation of the Holiday Inn, building of the Hilton Garden Inn, transformation of the Holiday Inn Express and the feasibility and construction of two Springhill Suites. Waldrip has a background in industrial engineering and his talent ensured that each property was kept up to standards. Waldrip continues to serve on The Classic Center Authority board of directors and has supported several expansions of The Classic Center. “Mike is someone I know I can count on to provide an honest and informed opinion on things that might affect our facility, guest experience and our overall effects of change on our industry and on our community,” says Classic Center Executive Director Paul Cramer. The second Louis Griffith Hospitality Leadership Award was presented to Mayor Nancy Denson. Denson’s administration has advocated for tourism and economic development through various projects. Under her administration Athens has seen an expansion of the runway at Athens-Benn Epps Airport and the addition of a passenger terminal. Denson has worked to improve conditions not only for guests, but also for workers by expanding the hours of the transit system and adding the Sunday route for easier transport for workers. Denson personally welcomes conventions to Athens with her warm greeting, letting them know how important they are to the community. She understands the power of the tourism industry and she has seen firsthand how much economic impact comes from the visitors. Mayor Denson truly “gets” hospitality. The Lifetime Achievement Award in Hospitality and Tourism honors a local individual who has a long history of giving back to the community. This individual has dedicated his time and other resources to help shape modern Athens. The inaugural Lifetime Achievement Award in Hospitality and Tourism recipient is Paul Martin. Martin was one of the leaders with a vision to create a civic, cultural and convention center in downtown Athens. He eventually was the one who put up significant personal capital to connect the Hyatt Place hotel to the center. Martin also served on the board for The Classic Center for eight years as well as the SPLOST Oversight Committee. His drive and support for the increase in hotel tax dollars helped to market Athens as a destination. Martin was also the driving force behind The Classic Center Cultural Foundation, which gives $30,000 a year in areas of performing, visual and culinary arts scholarships to children to further their education. He also pushed for more hospitality career development in Athens co-writing a grant to Athens Technical College hospitality program, working with Piedmont College to create a hospitality degree and starting the Paul T. Martin fund to support students who want to make hospitality a career. Martin and his wife June are significant contributors to the fund, which has generated more than $600,000. Full presentation is posted below. **Photos of hospitality award winners are available.